Maggot Art is a unique outreach program that combines art and science in an exciting and informative activity. Live maggots are dipped into non-toxic paint and allowed to crawl on paper, creating beautiful paintings. The Maggot Art program primarily targets youth at the elementary school level. The demonstration can be adapted to groups of any size, from small classrooms to large exhibitions that attract thousands of visitors each day. Students of all ages gain hands-on experience with maggots, organisms that few people understand or appreciate, while learning about a number of important biological principles such as animal development, morphology, and behavior. 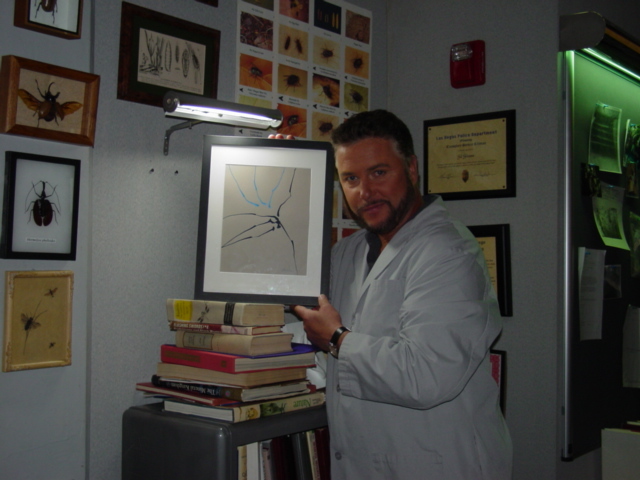 Have you ever wondered where Dr. Gil Grissom on CBS's CSI got that cool artwork behind his desk? You have come to the right place! Check out our Media section for more great pics, videos, and audio files. Or if you are looking for these great pictures for your home or office, stop by our (soon to be) newly redesigned store. A portion of the proceeds from t-shirt sales will support this and other entomology programs for the K-12 classroom. Thank you for shopping with us! The Maggot Art program would not be possible without the generous contributions of time from devoted volunteers. Please contact us if you would like to participate in an upcoming demonstration.